Iona Brown playing as a violinist with Neville Marriner and the Academy of St Martin-in-the-Fields. 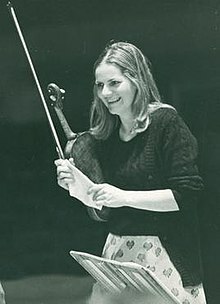 Iona Brown, OBE, (7 January 1941 – 5 June 2004) was a British violinist and conductor. Elizabeth Iona Brown was born in Salisbury and was educated at Cranborne Chase School, Dorset. Her parents, Antony and Fiona, were both musicians. Her brother Timothy has been principal horn of the BBC Symphony Orchestra, her other brother Ian is a pianist and her sister Sally plays viola in the Bournemouth Symphony Orchestra. From 1963 to 1966, Brown played violin in the Philharmonia Orchestra. In 1964, she joined the Academy of St Martin in the Fields, working her way up through the ranks to become leader, solo violinist and director in 1974. She formally left the Academy in 1980, but continued to work with them for the rest of her life. In 1981, she was appointed artistic director of the Norwegian Chamber Orchestra. King Olav V of Norway later awarded her the accolade Knight of First Class Order of Merit for her success with the NCO. She directed the Los Angeles Chamber Orchestra from 1987 to 1992. She was dismissed as conductor because of an inability to commit to more than six weeks per season with the orchestra due to her other posts, a decision she protested. Brown ultimately returned as the orchestra's principal conductor from 1995 to 1997 following a change in the orchestra's leadership. From 1985 to 1989, she was guest director of the City of Birmingham Symphony Orchestra. As her health declined and her arthritis progressed, she shifted her focus from the violin to conducting, ending her violin career in 1998. In her last years, she was chief conductor of the South Jutland Symphony Orchestra of Denmark. From 1968 to 2004, Brown's principal residence was in the Wiltshire village of Bowerchalke. When she took part in the BBC Radio 4 programme Kaleidoscope, explaining how hard it was to play her signature piece The Lark Ascending by Ralph Vaughan Williams, she said that the singing of larks she heard during long walks on nearby Marleycombe Down influenced the way she played it. She was made an Officer of the Order of the British Empire in 1986, and in June 2003 was made an honorary Doctor of the University by the Open University. She died of cancer in 2004 at age 63 in Salisbury. She was married twice, and was survived by her second husband, Bjorn Arnils. ^ a b "Iona Brown - Telegraph". London: www.telegraph.co.uk. 11 June 2004. Retrieved 19 November 2010. ^ "Iona Brown, 63, Violin Soloist Who Turned to Conducting". New York Times. Retrieved 11 March 2016. ^ Inglis, Anne. "Iona Brown obituary". The Guardian. Retrieved 11 March 2016. ^ Cariega, Daniel. "Iona Brown Gets Music Post". Los Angeles Times. Retrieved 11 March 2016. ^ Pasles, Chris. "Iona Brown, 63; Directed L.A. Chamber Group". Los Angeles Times. Retrieved 11 March 2016. ^ "British Conductor/Violinist Iona Brown Dies". Billboard. Retrieved 11 March 2016.